An important method for the study of long-term climate change involves isotope geochemistry. Oxygen is composed of 8 protons, and in its most common form with 8 neutrons, giving it an atomic weight of 16 (16O) -- this is know as a "light" oxygen. It is called "light" because a small fraction of oxygen atoms have 2 extra neutrons and a resulting atomic weight of 18 (18O), which is then known as "heavy" oxygen. 18O is a rare form and is found in only about 1 in 500 atoms of oxygen. The ratio of these two oxygen isotopes has changed over the ages and these changes are a proxy to changing climate that have been used in both ice cores from glaciers and ice caps and cores of deep sea sediments. Many ice cores and sediment cores have been drilled in Greenland, Antarctica and around the world's oceans. These cores are actively studied for information on variations in Earth's climate. Figure 1. 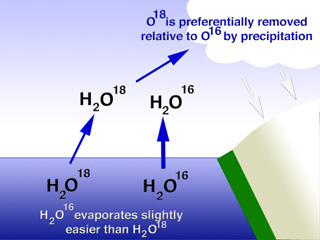 Light oxygen in water (H216O) evaporates more readily that water with heavy oxygen (H218O). Hence oceans will be relatively rich in 18O when glaciers grow and hold the precipitated 16O. Ice in glaciers has less 18O than the seawater, but the proportion of heavy oxygen also changes with temperature. To understand why this might be so, we need to think about the process of glacier formation. The water-ice in glaciers originally came from the oceans as vapor, later falling as snow and becoming compacted in ice. When water evaporates, the heavy water (H218O) is left behind and the water vapor is enriched in light water (H216O). This is simply because it is harder for the heavier molecules to overcome the barriers to evaporation. Thus, glaciers are relatively enhanced in 16O, while the oceans are relatively enriched in 18O. This imbalance is more marked for colder climates than for warmer climates. In fact, it has been shown that a decrease of one part per million 18O in ice reflects a 1.5°C drop in air temperature at the time it originally evaporated from the oceans. While there are complexities with the analysis, a simple measurement of the isotopic ratio of 18O in ice cores can be directly related to climate. Ice cores from Greenland or Antarctica are often layered, and the layers can be counted to determine age. The heavy oxygen ratio can then be used as a thermometer of ancient climates. H2O is evaporated from sea water. The oxygen in the H2O is enriched in the lighter 16O. This H2O condenses in clouds, falling on land as precipitation. 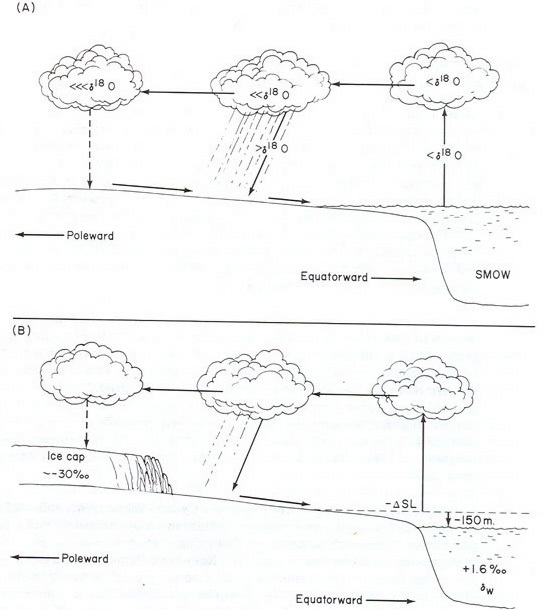 Thus, H2O that is part of the terrestrial water cycle is enriched in the light 16O isotope and sea water is enriched in the heavier 18O isotope. Glacial ice is therefore made up primarily of water with the light 16O isotope. This leaves the oceans enriched in the heavier 18O, or “more positive.” During glacial periods, more 16O is trapped in glacial ice and the oceans become even more enriched in 18O. During interglacial periods, O16 melts out of ice and the oceans become less 18O rich, or “more negative” in 18O. The same isotopic analyses can be made in ocean sediment cores on the shells of dead marine organisms (Figure 6). Some of these organisms are made up of calcium carbonate (CaCO3), and the oxygen in the carbonate reflects the isotopic abundance in the shallow waters where the creatures lived. Thus if we can find and date ever more ancient sediments made up of old sea shells, we can determine the isotopic ratio of oxygen and infer the sea surface temperature at that time. The more 18O found in the sediment, the colder the climate (inverse relationship to that of glacier ice). Figure 6. A micro-photograph of small skeleton-bearing plankton sea creatures. When such creatures die, their shells fall to the bottom of the ocean, carrying the tell-tail oxygen isotopic ratio appropriate to the temperature of the surface waters where they lived.